One convenient download. One bargain price. 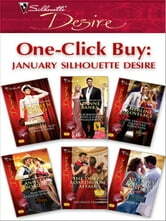 Get all January 2009 Silhouette Desire with one click! A former actress is forced to play the role of fianc?e to protect her troubled sister. An executive orchestrates a Valentine reunion with his long-lost lover in sunny Spain. And a Navy SEAL and millionaire's heir gets married...to a woman he's never met. 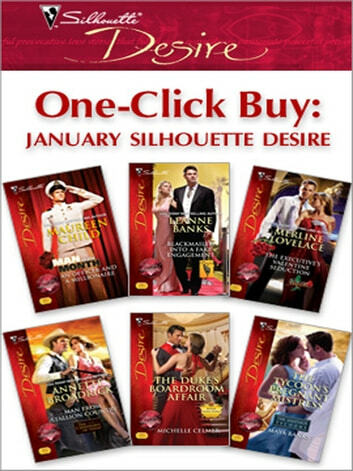 Experience the passion and romance of these stories and more with all six January Silhouette Desires! Bundle includes: An Officer and a Millionaire by Maureen Child, Blackmailed Into a Fake Engagement by Leanne Banks, The Executive's Valentine Seduction by Merline Lovelace, Man from Stallion Country by Annette Broadrick, The Duke's Boardroom Affair by Michelle Celmer and The Tycoon's Pregnant Mistress.